This afternoon we announced that in 2017 Google will reach 100% renewable energy for our global operations — including both our data centers and offices. This is a huge milestone for us globally and here in Europe, a region that’s truly leading the way for renewables. We’re quite proud that our commitments have reached 2.6 GW, making us the largest corporate purchaser of renewable energy in the world. In addition, today we celebrate the opening of our newest datacenter in Eemshaven, the Netherlands, which is the first Google datacenter to be powered by 100% renewable energy from day one. To match the energy we consume at this latest addition to our fleet of cloud computing facilities, we procured renewable energy from a wind farm in nearby Delfzijl. A second wind project was announced recently in Zeeland through a new community owned cooperative of 4,000 people called Windpark Krammer. Representing the very best of Google engineering, construction of the datacenter took two years to complete, and on average 1,500 people worked on-site each day during construction. Now that its operational, the data center will provide employment for up to 200 people in a range of roles including computer technicians, electrical and mechanical engineers, catering and security staff. 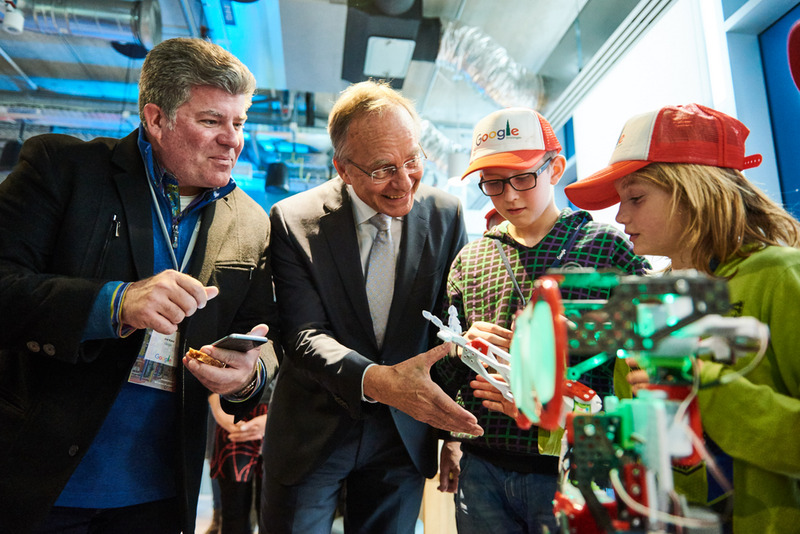 Google's Joe Kava and Dutch Economic Affairs Minister Kamp with local students at the Eemshaven datacenter opening. After starting discussions starting in 2012, we chose to build a datacenter in the Groningen province because of the quality of the local infrastructure including a suitably sized plot of land, the capacity of the electrical grid, water for cooling, and high speed fibre connectivity. Since then, 6,000,000 work hours have gone into getting the datacenter ready for today’s opening and technicians have run enough computer cables--16000 km in total-- to reach from Eemshaven to Australia if laid end to end. We’ve worked to give back to the community of Groningen with initiatives like teaching kids coding at Hanze Hogeschool, several nature projects and training students and entrepreneurs in digital skills with the Digitale Werkplaats. The datacenter opening is about Google making a home in Groningen, about employing local talent, and us saying we’re here for the long term, and we look forward to being part of the community. Google datacenters are some of the most efficient in the world. Today, they get 3.5 times more computing power out of the same amount of energy as 5 years ago. But as our SVP of Technical Infrastructure Urs Hölzle wrote earlier today, we’re only in the early stages of this work. As we look to the immediate future, we’ll continue to pursue power purchases like those in the Netherlands with an even greater focus on regional renewable energy purchases in places where we have data centers.